I've reached the half-way point of my husband’s deployment. If I'm really honest, this deployment is beginning to wear on me. How could we only be half-way? Murphy's Law has been prevalent in my home. If it can break, it breaks. It began with a broken bone in my foot. From there I've had to repair all three of our cars, replace an oven twice, replace a vacuum cleaner twice and call a plumber. And let’s not forget the horrible winter we had. When I returned home one evening last week and the door from the garage to the house would not shut I looked up shaking my head at God saying, “Enough is enough!” Obviously, He is not to blame. My patience has begun to run thin. Our conversation did not end on a high note. The tension was sensed. Actually, there has been tension our past few conversations. I've begun to get angry with the army for taking my husband away from home. I'm being selfish and it comes out with my anger pointed toward my husband instead. I hate admitting my selfishness. I'd like to say he's the one being selfish. My husband serves our country on the other end of the world to defend our freedoms and I’m calling him selfish? Even if he had been selfish, I must first take a look at my own selfishness (Matthew 7:3-5). We hung up the phone and it didn't take long for satan to do what he does . . . enter guilt and condemnation. I've had enough of him. He will not win. Instead, I’m putting love in action. I downloaded a copy of the book The Love Dare for my Kindle. 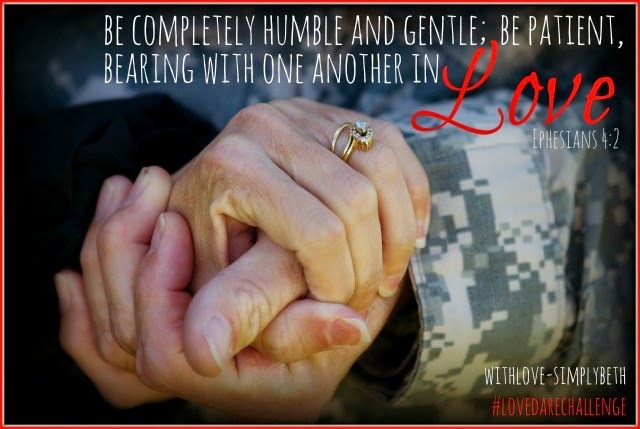 There happens to also be a Love Dare devotional to help military families stay connected during deployments. I’m armed and ready for a Love Dare Challenge. Day 1 (of a 40-day Love Dare Challenge) is ironically titled Love is patient. I read the day’s devotional and came to the words, “Anger is usually caused when the strong desire for something is mixed with disappointment or grief." I want my husband to return home now. I know he cannot which disappoints me and makes me sad. “You don’t get what you want and you start heating up inside. It is often an emotional reaction that flows out of our own selfishness, foolishness, or evil motives.” I’m angry. And I've been selfish. Anger and selfishness are sins. Jesus does not condemn me for my sins but He does say, “Go and sin no more” (John 8:11). I have a choice. I can continue to be angry and selfish or I can choose love instead. I purchased a Life Application Study Bible recently to help me dive into scripture. For 1 Corinthians 13:4 it says, “Much irritability comes from a love of perfection, a deep desire that programs, meetings, and structures [everything] be run perfectly.” I desire for things to stop breaking. It would also be desirable for my husband to be more sensitive to my growing list of new responsibilities. I'm reminded of how perfection only exists in God. 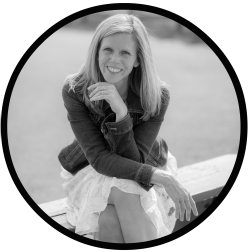 I need to love my husband, not my vision of perfection. Love Dare #1: Here is today’s dare during deployment: In email, phone, or letter—do not say or write anything critical or negative. Even if you are on the receiving end of a verbal attack, choose to be quiet. I had one item to take care of first. That tree issue I mentioned has now been resolved. Since the day I snapped at my husband I've been intentional to not write or say anything critical or negative, even if temptation aroused, because patience “gives you the amazing ability to hold on during the tough times in your relationship rather than bailing out under the pressure” (The Love Dare – pg. 2). Trust me, tough times come along with deployments . . . I’m not bailing though. Lesson learned: I need to do the Love Dare Challenge without expectations of something in return. Not that my husband doesn't love me back. But I was reminded of how God’s kind of love requires nothing in return. We cannot do anything to make Him love us less or more than He already does. Next week: Love is kind. My husband used to travel much more than he does right now - and it is hard - especially with Murphy's Law - the teens are harder than when they are little. Then it was hard for about 3 to 4 days after he came home (depending on how long he was gone) - because it takes time to adjust being home, to all the differences - I would expect him to be ready to jump in and help - and he would have jet-lag and not be used to the routines. However - love and not giving up, forgiving and reaching - all bridge that gap. Praying for you Beth - and thank you both for your service to our country! "Love and not giving up, forgiving and reaching - all bridge that gap." Words I need to remember. The military talks much about how difficult the return home can be. I'm just always grateful I don't need to do this journey without God. Thank you so much for linking up again this week and for your kind words. Blessings. Thank you so much, Satin. I'm so grateful for all your love, support and encouragement. You are an amazing friend. Love you. I've missed you, Bev. Really, really miss you. Thank you for your continued prayers. We really need to catch up. Ahhhh, Love Dare. I was just talking to a friend about this one…I must get a peek at that book. I've glanced through it previously but looking forward to taking this journey slowly. Always a delight to see you here, Amy. Halfway there, my friend! Just think, now you have less time to go in the deployment than has already passed! I know that deployment fairy can be so frustrating. Praying that he will leave you alone for the rest of Scott's time away. So glad you are finding positive ways to cope (like your Bible study). Much love! I am grateful for the time that has passed. And with warmer weather upon on I'm feeling positive the days will go by a bit quicker. Thank you for all your prayers. Love you, friend. Beth - Even though I am not a military wife, this post resonated with me as my husband worked longed days while our children were growing up. Well, he still does but our family is now grown. There were nights he came home long after the kids were asleep. Over the years, people have asked me how I was able to do it. My friend, it was possible only as I leaned on God each day - some days, minute by minute. This should be a wonderful series both for you & for others too. Before leaving this comment, I went to read ! Cor. 13 in my own Bible :) It is such a familiar passage & yet this morning, it fell fresh as this truth hit me - "The greatest of these is love." It is not spiritual gifts or talents. Even while faith and hope will also last forever, it is LOVE which is the greatest. We will never look more like Him than when we love like Him-sacrificially & unconditionally. Love is the greatest because it is the very nature of God. I am grateful you shared from your heart on this today. With love & a hug! I've learned to appreciate that no matter the length of time apart, it's hard. And it can even be hard with grown children. That day I snapped at my husband, God just spoke so clearly on wanting to guide me in choosing love instead. Just one week and I'm blown away by how He blesses us when we obey. Thank you for your encouragement, Joanne. I'm always so blessed by your comments. Much love to you. Wow ... this is neat! I've used the Love Dare with counseling clients but didn't realize that there was a deployment version for military couples. I'm so thankful that you've found this little treasure, and pray it will bring you encouragement to your soul as you soar through this final lap. What a fabulous little gift for you both. Beth- this post is a blessing to me! In it you are honest and you show this amazing decision to follow God even when things aren't going right. It resonates with everyone because we all have that struggle. I hope to link up today, but even if I don't I am glad I stopped by to read. Love you! I've been thinking of you, Lauren. I know life is crazy and I'm sending many hugs your way. Thank you for stopping by and always happy to see you link up. Love you. Oh sweet friend, how I can feel your pain! My husband deployed twice for a total of 27 out of 48 months - what a strain that puts on a family and marriage. I too have been the annoyed one on the home-front, wondering if he could possibly understand what I was going through - selfish yes, normal, also yes. Thank you for sharing your heart today and best wishes for you and your family during the remaining months of deployment. I said to another military spouse today how helpful it is to know you are not alone in those selfish feelings. Thank you so much for sharing, Shannon. Much love to you. Oh Beth, this is going to be a beautiful journey. My husband and I have had our own stresses of late, and it is also manifesting in me in anger. I have so many unmet needs, that I automatically expect him to come and fill, where the only One who can is God. I am excited about this journey and know that God will speak to me through it. Hugs! God may be teaching you much through this journey, but for me, you're also teaching me as well. I loved that version of 1Cor 13:4, I'm going to write it down to remember. I need to remember as well, that there is only one that can truly love and fill me and it's not my husband. Thank you for your heart-honesty. Thank you so much for your kind comment, Alecia. I'm always so delighted to see you link up. I'm hoping to catch-up on posts tomorrow night. Much love to you. Hi Beth! Wow, you learned a lot from one phone call. God really used that situation to raise you to a higher place, didn't he? I read recently that love brings us to very strong emotions. From full-on love to full-on anger. Such a powerful emotion. Best of blessings on your journey out of negative to positive. That's a very powerful journey, and I know you will be blessed immensely. Thank you, Ceil. I do love how God will use it all. He wastes nothing and I'm so grateful that He spoke to my heart to take this journey. I'm looking forward to meeting you soon. Blessings. It's so hard, even harder when there is distance. Many prayers, thank you for encouraging other in the midst of your difficult days. Much love. Thank you, friend. Much love to you. Beth~You made such a wise choice in response to the stresses of deployment. I know they can be hard with our youngest just returning. And, I know it's even harder as a spouse. Your Bible Study will keep you strong and bless all of us on the journey with you. Oh those homecomings...I get all teary-eyed thinking of that day. Such joy. Keeping you in my prayers, Janis. Blessings to you. Oh girl. This is excellent. Our marriage started with deployments, and after 15 years we have been through 8 of them. My hubby has deployed 11 times in all. I SO get this. There have been awful times of selfishness and also wondering how he could be so selfish. It's a tough road. BUT, I love how you are bringing The Love Dare into this! I love that book. I wish I had had it during our deployments. God is so good and has brought us through so many seasons of growth in His powerful, loving arms. Press on, sister. You are awesome. And so is your soldier. Love you so much. He is SO good. I love how He has brought you into my life. You have given me so much encouragement during this time apart from my husband. THANK YOU. Love you, Karin. Oh, Beth! Halfway there! Halfway there! You are sliding down the hill towards the finish line. I am continuing to pray for you. I look forward to reading your Love Dare series. What a great idea! You made me smile, Elizabeth. Yes!! Halfway there is reason to rejoice. Thank you for your prayers. Much love to you. 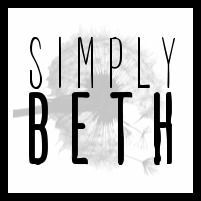 This is awesome, Beth!!! I am so excited for you! So glad you are taking us on this journey with you - it will be a beautiful, sweet testimony, I just know it! God blesses obedience, my friend! Praying for you. I just adore you, June. I've read your sweet email many times this past week. Thank you so much for you prayers and for all your encouragement. You are a blessing. Much love to you. I know how hard it can be at times to love them when they are home. Any time my husband is away for a longer period of time I ask God to remind me of how much I missed him and to help me appreciate him more when he is home. Love isn't always easy . . . but it's so worth. Thank you for your encouragement. I love this, Beth. "Love is patient." That is a perfect first step. So often we think of love as a feeling...as something that happens in our hearts and that is that! But besides love starting through attraction, it is grown through action. True love, like you mentioned above, doesn't require anything in return. Wow. What a challenge...to love without counting what we get back! Choosing to love honors God :) This is going to be a great series...thank you for sharing your journey with us! P.S. Congratulations! Since this is a day after you posted this, that means you are PAST the halfway mark in your husbands deployment!! You are now on the downside! Yeah! Plus...we're coming on to summer. Things are looking up! That lesson on not expecting anything in return is one He pointed out rather quickly. It's also one I need to keep reminding myself of. So grateful for you, Joan. And yes...summer is coming and things are surely looking up!! Love you. Thank you for being so transparent about your feelings, Beth. It must be so difficult to have a husband deployed. Praying God will give you strength for each day. Thank you for stopping by, Trudy. And thank you for your prayers. Blessings to you. My hubs is on a missions trip in Ghana, Africa for two weeks and that is hard for me...I can't imagine what you and other military wives feel. Love you, Beth. I'm so glad we "met" through our word for the year. JOY in a year full of challenges, right? Your quote about anger is so, so true. Any amount of time away from our spouses is hard. I will keep you in my prayers, and also your husband, during this time apart. I'm so glad we met too, Elizabeth. Yes, it has been a year full of challenges but God is so good. Much love to you. Thank you, Renee. That big hug would be wonderful and I'm so grateful for how He provides them just when they are needed. Blessings to you. Oh, I love this! 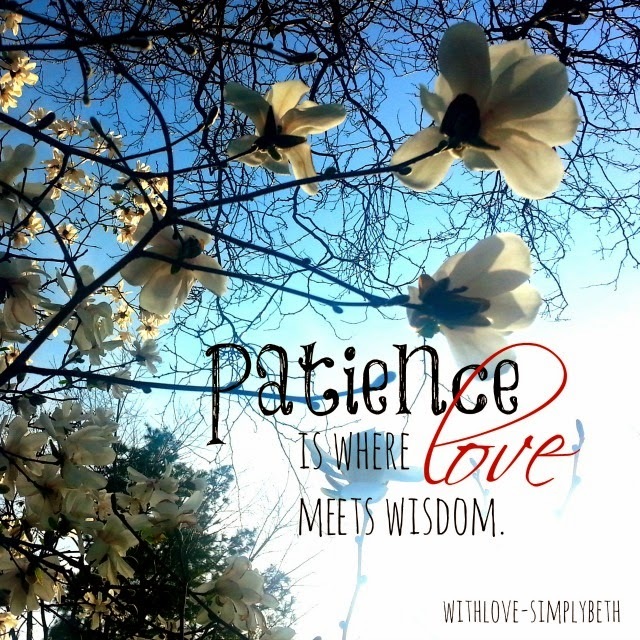 And what a beautiful picture with the words ... "Patience is where love meets wisdom". Sounds like a great "Love Dare" book to read and put into practice. Thanks for your sweet and honest post. Thank you for stopping by, Cherry. Blessings to you. Oh Beth-- this is going to be an amazing experience for you and the hubs :-) And YIPPEE for the halfway point of this deployment-- that is HUGE... Just think of it as a long run... it's all down hill from here! YAY! I have no idea how it would be to have my husband deployed. I do know how it was to have him out of state 7 months for a job. Not the same, I know, but relatable! :) praying for you! You are strong! You are loved! You are made to live in victory! Blessings to you & yours!